This is a repost of a poem that I wrote last year. As I reflect this Easter on the nature and character of God, and of his son Jesus, it seems just as poignant and real as it was when I first wrote it. For me anyway. It reflects where I am on my spiritual journey and how I have grappled with the God revealed in the Christian community and Christian practice I have grown up amongst and which I choose to be part of. And this is most definitely for me a process of change. For much of my life, I saw the cross predominantly through the lens of the more recent Protestant view of penal substitutionary atonement. I have come to struggle with this view in that for me it reveals a God from whom we must be saved by Jesus. I can no longer live with this view of the divine. Jesus does not stand between us and the punishment of God, as if he were the only thing preventing God from throwing us sinners into the pit of an eternal hell. No. Jesus reveals what has always been true of God – that his posture toward us has always been that of love, and his response to our self-destructive and violent actions has always been to offer forgiveness. The cruel and violent nature of the cross reveals more about the lengths humanity will go to in clinging to power. And that is damning. Unfortunately over the last thousand years the Western Church has drifted into the idea that God required the violent death of his Son in order to satisfy his honor and pay off justice. (A theory that was wisely rejected in the Eastern Church.) In an attempt to explain the cross according to the honor codes of feudalism, the character of God has been viciously maligned. The cross is many things, but it is not a quid pro quo to mollify an angry God. Above all things the cross, as the definitive moment in Jesus’ life, is the supreme revelation of the very nature of God. At the cross Jesus does not save us from God — at the cross Jesus reveals God as savior! When we look at the cross we don’t see what God does, we see who God is! The cross is not a picture of payment — the cross is a picture of forgiveness. 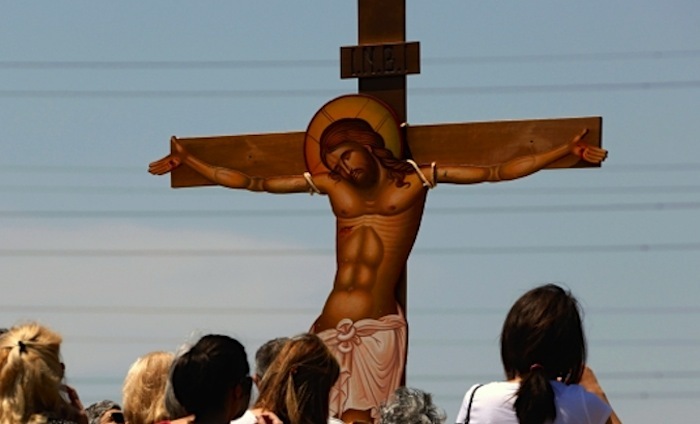 Good Friday is not about divine wrath — Good Friday is about divine love. Calvary is not where we see how violent God is — Calvary is where we see how violent our civilization is. The cross is not where God finds a whipping boy to vent his rage upon — the cross is where God saves the world through self-sacrificing love. It is that time of year again – Easter – that time God died. crime did they take his life? and threatened only by his kind acts and confronting words. hold on power, better that one die for the many they said. happen today as it did then. the life of God to us all.